I might sound like a broken record, but one of the factors that constantly reminds me why I love working in this genre, is the communities that grow up around a game. They can vary in size, shape, or form, but they often serve as the thing that cements relationships, and builds players relationships with an MMO. 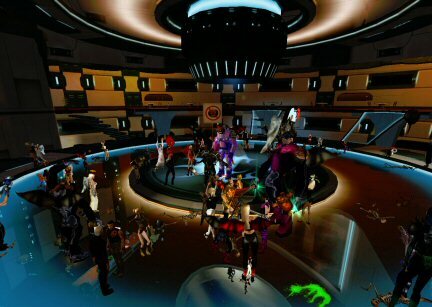 One such community can be found in Anarchy Online, and will celebrate their tenth anniversary this year. Gridstream Productions is an internet radio station that was founded by AO players a decade ago. Ten years, that's a lot of songs, broadcasts, and shout-outs. All united by their love of Rubi-Ka and the community around the game. They have hosted parties, anniversaries, weddings, and every kind of celebration you can think of. They have employed dozens of DJs down the years, all of whom volunteer their time to entertain their fellow players. I have been lucky enough to meet some of their crew at events like Dragoncon and the hosted AO events down the years, and they are a wonderful bunch of people. Hailing from as broad a spectrum of backgrounds as you'll find in an MMO community it was amazing how all these very different people came together, all united by their passion for the game. Ten years is a long time, and a lot of work, in particular for a volunteer organisation. Many professional projects don't even last that long. The fact that they can celebrate ten years on air is a wonderful testament to their dedication. Rubi-Ka and the Anarchy Online community will always have a special place in my heart, and the folk at Gridstream are a part of that. ... and happy birthday guys! I can't believe it's been 10 years for GSP either. Spent many a Friday and Saturday night listening to Tarryk and company. I remember the Live 365 days when I was never sure whether the stream had gone down or if I'd lost connection. GSP in a large part of why I've been a loyal AO'er!